The Jindo dog breed emerged in Southwest Korea many centuries before for the hunting of badgers, rabbits, deer, and wild boar. This is considered to be a National monument is Korea and exporting Jindo is banned. Thus they are not very common in United States and did not appear there until 1980s. It is a medium size dog breed of Spitz type and is independent, alert and an expert hunter. They are brave, lively and brainy and are known for their homing instinct as well as high prey drive. Due to their independent and stubborn nature, they are not made for inexperienced dog owners. The Jindo are extremely devoted to their family and thus they do not do well at being re-homed. They will fight to death in order to protect their family and home, in spite of being loving, friendly and soft, and thus make for an excellent guard dogs. They are at their best behavior with mature children and other dogs that they have been raised with. They have a high prey drive and thus are not advisable for a home with non-canine pets. This breed of dogs loves to live indoors with the family and may cause damage if left isolated. The Jindo breed sheds heavily twice a year and at that time it must be brushed everyday along with warm baths which may help in the shedding process. Even otherwise it needs regular brushing so that loose hair may be minimized. It has two coats with the outer one being straight, harsh and denser on the neck and chest and on the other hand the undercoat is thick and soft. Early socialization and obedience is a must and must be done with respect, strictness, justness, continuity and dedication. Jindo is one of the dog breeds that is not not apt for apartment living because it has high energy and thus need a ground which is secured and fenced. They love to play with their family and will benefit from daily exercise. However, they must be properly leashed in public area. 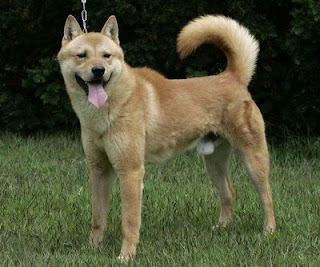 Jindo dog is a generally healthy breed and lives on an average for 12-15 years. However, hypothyroidism is common.